Quick check-in and a day late. Not a lot of progress this past week, but I did have a major revelation. The novella, which was supposed to be a giveaway for signing up for my mail list, is now going to be a novel. To be precise, the second book in the series. The story contains a crucial thread for the overall series. And yes, I could weave that into the series, I feel it’s better if I simply expand the novella into an actual novel. Once I made this decision, half a dozen plot threads popped into my mind. It’s not only doable, I think it’s going to be a lot of fun. Bowker is up and running again, and I have a new block of ISBNs. 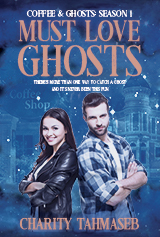 I’ve started the process of getting the large print versions of Coffee and Ghosts into the system. The interiors are done, but I need to adjust the covers because more pages = larger spine. This week, I worked on the revision to The Trouble with Necromancers. I made a chart with all the main and secondary characters and then went through and detailed how each character interacted with Poppy (the main characters) and each other, along with other details–what nefarious plans they have, where they’re going (or think they’re going), any ties between them. I have somehow come up with a story that, while contemporary, has a number of threads that start in the past. I need a chart to keep this all straight. I also read somewhere that the protagonist’s journey should be strong enough that it prompts a change in the other characters in the story. I don’t think this needs to be heavy-handed. But I think it’s something to keep in mind, especially for a series. That’s it for this week. Now, back to charting. Just a quick check-in to say: The Trouble with Doppelgangers is complete at 24,000 (give or take). I’m relieved that it didn’t turn into an actual novel. Because I would need to write another subscriber bonus (which would then turn into another novel … you get the idea). It also reminded me how much I like writing novellas. One of these days, I’m going to have to write another novella series (I have an idea in mind, one involving dragons–sort of). So, once I launch the Tea & Sorcery series, I’ll send the bonus to my mail list (for the curious, you can sign up for that here). I missed checking in last week due to a big event my Girl Scout troop hosted. This week, I’ve been down with a virus (fortunately just that) so I’m not quite done with the novella. Almost. I can see the end from here, and I’m excited to get back to it. So this week, this week, I’m hoping to finish up the novella. Then, it’s thinking time. I’m not sure what I’ll tackle next. The third draft of the series starter? Maybe. Or maybe I’ll let that rest for a little while longer and revise another novel that’s been on the back burner. That’s it for this week. Until next time, I’ll leave you with all those gorgeous leaves. I missed last week, but I have a good excuse. To the left. That. That’s my desk at the moment. And last weekend, I was all: I can’t even. But there’s light at the end of the tunnel, and I’m pretty sure it’s not an oncoming train. I have been getting some writing in (thank you, Starbucks). I have about 15,000 in the novella so far, and I really hope I can finish it up this coming week. In other news, I’m doing a short-term promotion for Straying from the Path. If you like fairy tale retellings and haven’t grabbed a copy yet, here’s your chance. Just 99 cents, just about everywhere e-books are sold. A quick check-in this week, because we’re doing a little renovation around here (painting and floors and such–nothing structural, thankfully), and I’m tired. But I did pass the 10,000-word mark in The Trouble with Doppelgangers. I’m pretty sure it won’t turn into an actual novel (although, if it does, I can always make it the second book in the series). I also set up a few promotions, and I’m certain I did some other things as well. At the moment?